Click on photos or titles for more information. NEW LOWER PRICES!! These CDs require and include anaglyph (red/blue) 3D Glasses. These require and include 3D glasses and a Lorgnette for viewing pairs. These include samples of Jim Long's 3D Conversions. Jim is considered to be one of the Worlds foremost 3D converters shows a great deal of his work here. 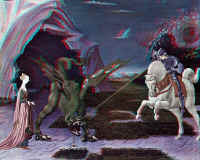 They are presented in both Anaglyph and side by side format here. Of special note is a PowerPoint presentation that includes a 20 minute tour of the photos in anaglyph format with music. The PowerPoint plug in is included with the CD. For more information on how to do your own conversions from 2D to 3D, please see the DVD on doing your 3D Conversions. More Info. 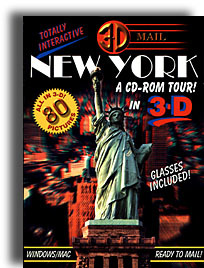 This CD-ROM includes a historical collection of over 1,000 modern stereoviews presented as both stereo pairs and as anaglyphs. The backs of each stereoview are also presented to document what is contained in the 3-D image on the card. Several years ago Bill created a book, "BACK TO BASICS: INFANTRY ONE STATION UNIT TRAINING IN 3-D." This book contains 75 black & white stereo pairs of today's infantry soldiers' initial training at Fort Benning, Georgia. This CD includes many more images that were taken during the creation process of this book. Plus many other stereo photos.